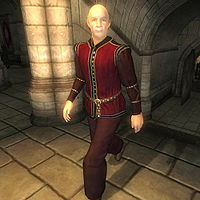 Esbern is a Nord priest added by the Knights of the Nine official plug-in. He will appear as a replacement for Hil the Tall if he is killed (no matter what the cause) at the end of the Umaril the Unfeathered quest. His schedule and services are nearly identical to those of Hil the Tall, especially in that he also offers basic training in Illusion. He resides at the Great Chapel of Arkay in Cheydinhal. Esbern wears burgundy linens, a pair of thick cowhide shoes, and a burgundy linen shirt. He carries a small amount of gold and the keys to the Cheydinhal chapel and its undercroft. Esbern knows a leveled set of priest spells, as well an extra major Restoration spell. This page was last modified on 20 May 2018, at 06:30.